Both of these teams won their opening Top 16 game last week and with Gran Canarias losing on Tuesday night, the winner will create a bit of a gpa between themselves and the initial favourite for the group stages. That should be a strong incentive when these two sides clash in Krasnodar, for what is going to be the first ever meeting in the EuroCup for these teams. Lokomotiv come into this game on the back of a huge confidence boosting win in Gran Canaria against a team that were tipped by many to top Group E. The hosts have achieved success with a strong defensive work ethic so far this season and this is likely to be a factor in their play in this game. Kevin Jones has been a hugely influential player so far this season for Lokomotiv, offering an average of 12.1 points per game while also providing an average of 5.1 rebounds per game. There has also been a good showing from Mardy Collins, with an average of 11.4 points per game and 5.7 rebounds while Matt Janning has also provided an average of 10.3 points per game. Murcia won a European game against Spanish opposition last week and considering the EuroCup Group E has three Spanish teams in it, this will need to be a feature of their campaign. That big win gives them a platform to push on but this is the only game they’ll play outside of home shores in the Top 16 and it is likely to be a tough task. Facundo Campazzo has provided an average of 14.8 points per game while Billy Baron has offered up an average of 13 points per game. Vitor Faverani has also been a key player, providing an average of 11.6 points per game. 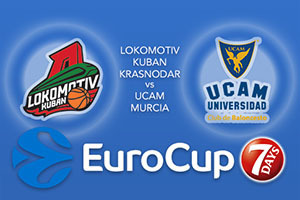 The bookies make the hosts big favourites for this game and you can back UCAM Murcia at +11 at odds of 1.90. If you have an interest in the Over/Under market, you can get involved at UNDER 156.5 which is on offer at odds of 1.90. Bet Now!